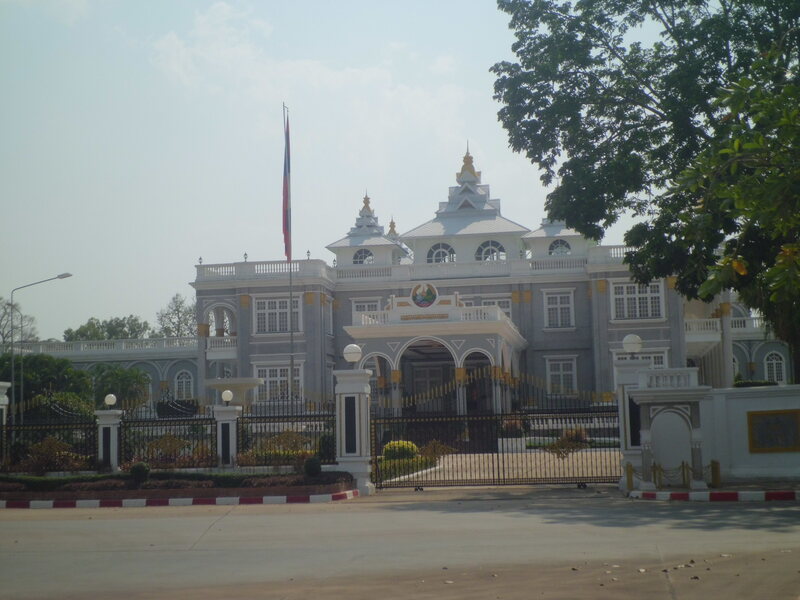 Sabaidee Vientiane! 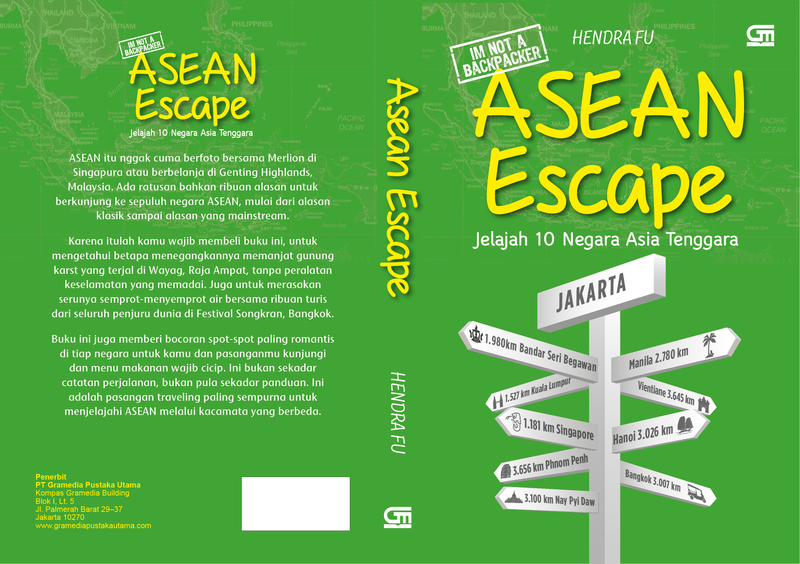 Finally, after six month leaving Singapore and doing such tedious routine, I have another opportunity to continue my South East Asian trip. Lao is the first stop before going to Philippines. In this opportunity, I only have limited time to visit Lao, since the ticket was booked suddenly and I haven’t set any plan yet. 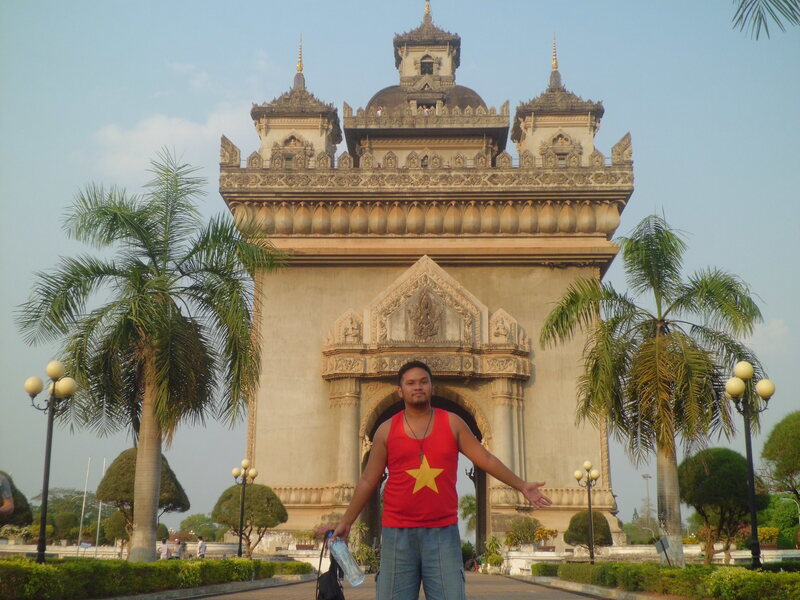 Therefore, on these two effective days, I will just spend my quality time in Vientiane, the capital city of Lao. The passport has already been stamped and I had changed my Dollars into Kip. With my two US friends whom I met on the plane, we shared the taxi to go to Setthathirath rd, the backpackers area in Vientiane. 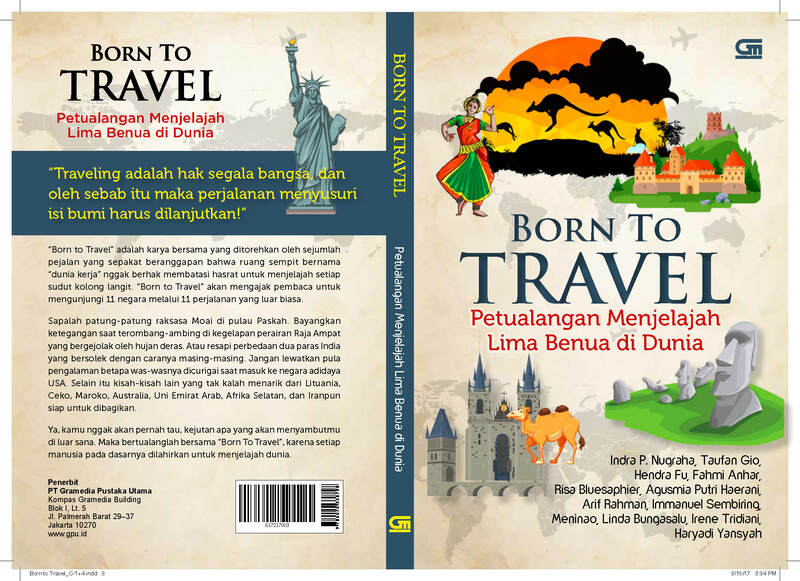 John and Cristina–suprisingly–have just spent their long vacation in Bali and Lombok before going to Lao. They even know some local language and they already get used to eat rice in the morning (something that Caucasian would not rather have for their breakfast). And especially John, he said that he is always craving for eating anything with sambal. 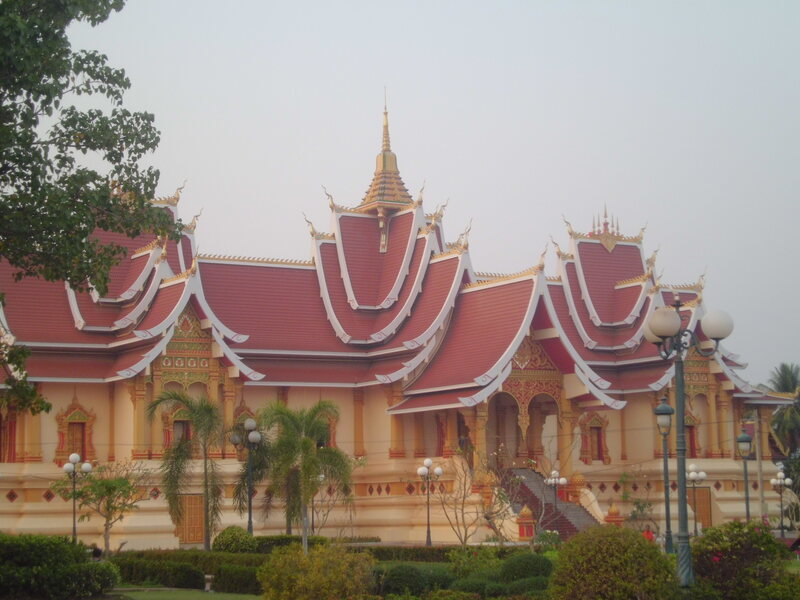 Vientiane, although becomes the capital city of a country, is a very simple yet charming city. 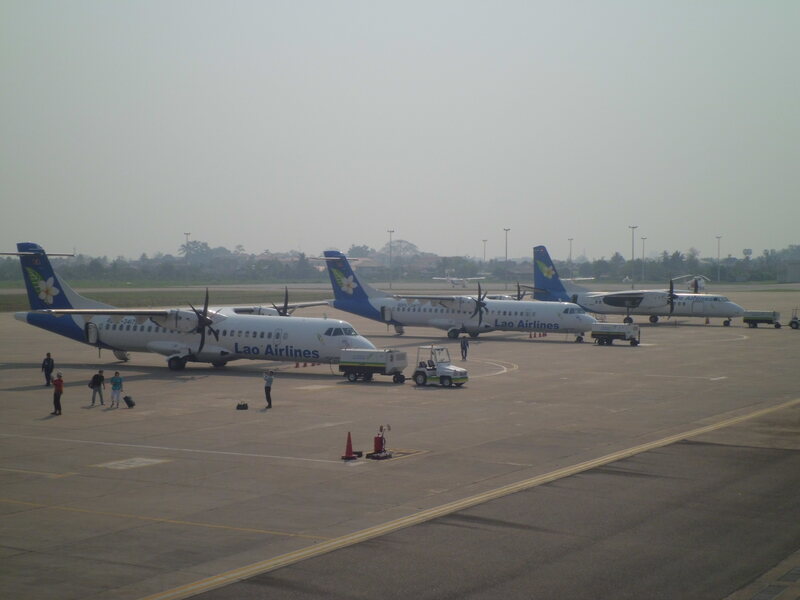 What I like from its surround is, Vientiane is not as rush and crowd as Jakarta or Phnom Penh. Some sightseeing tourism site could be reached on foot. The food is affordable and very delicious. And one thing, the vendors both inside the shopping center or the night market act not so pushy or forcing you to buy their stuffs. Well, on this note, I will try to sum up things I did and visited during two days spent there. Presidential Palace is the nearest place reached, a few walk from our hostel. This building is now used as the office for government offices and for state receptions. When I got there, the gate was closed and seemed like this place is closed for public–so I could just take some pics from outside. 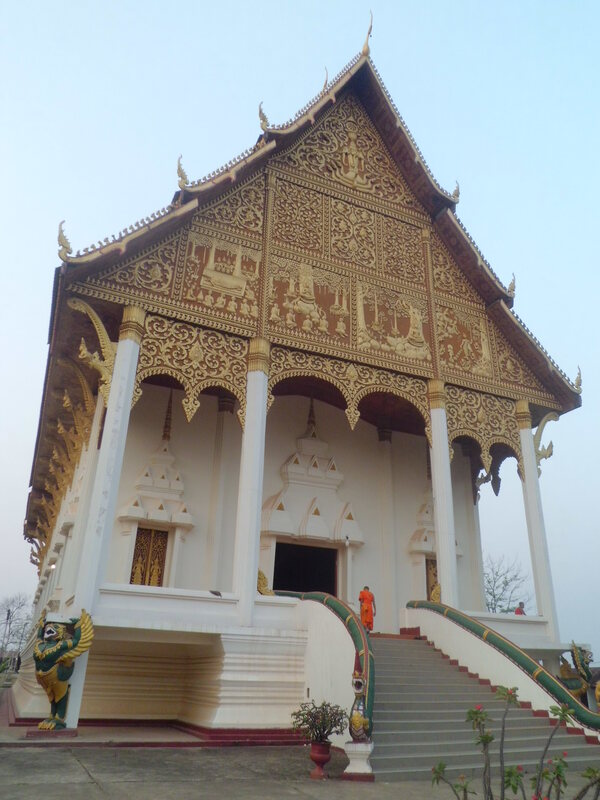 Near this palace, we can also visit Wat Si Saket, a temple which has cloister wall with thousands of Buddha images and hundreds of seated Buddhas on its rows. Unfortunately I didn’t visit the temple because it was closed after 4 PM. Patuxai is a gate which symbolize the victory of the war against French colonialism. Although it looks like Arch de Triomphe in Paris, but it’s built in Laotian design with some mythology creatures seat on some corners of the arch. Before 4 PM, every tourist has the chance to get into the arch, climb up the stair to its peak and enjoying the scenery of Vientiane from above. 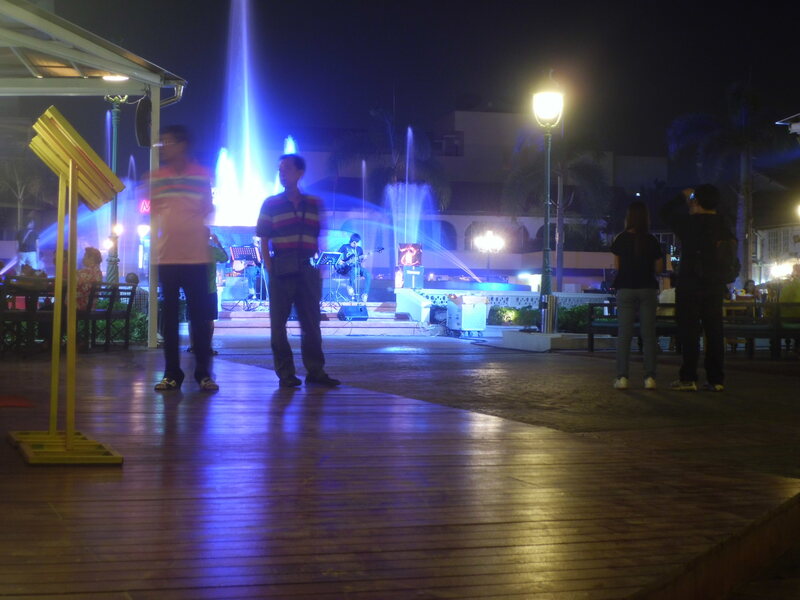 Near to the arch, we can also take some pics at the fountain while taking rest and buying street foods. 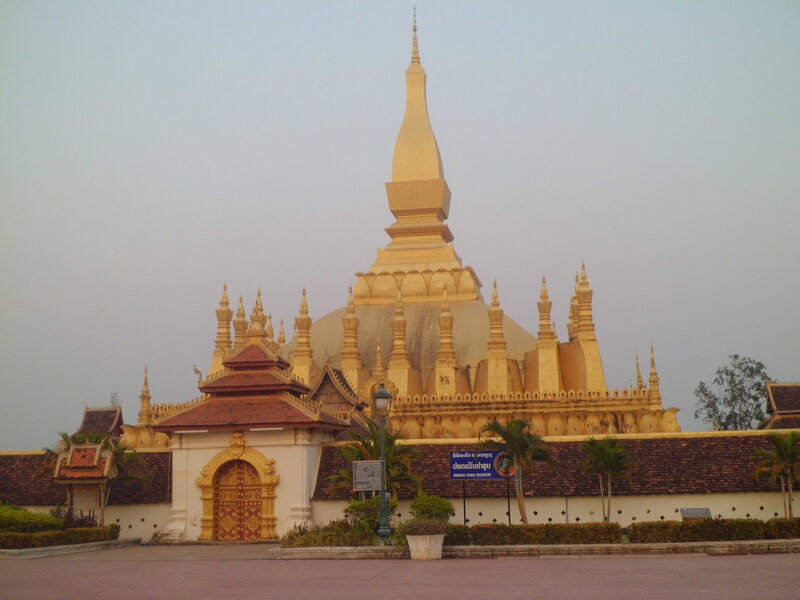 Pha That Luang is a giant gold Buddhist stupa which locates in That Luang road. Although it could be reached on food, but you do really need to spend extra energy to get there. 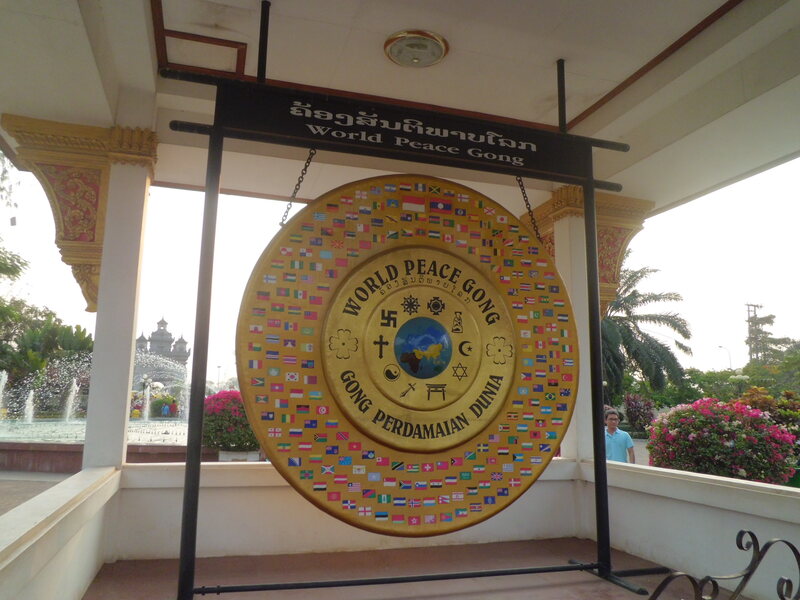 From Patuxai and World Peace gong, you just need to go straight along the way. Again, since it was too 5 PM, too late for us to get inside this Buddhist stupa. However, we could still adore the scenery surround us, two huge building of Buddhist temple with artistic architecture and its ornament in detail. While staring at the perfect round reddish sun which sets brightly on the sky. 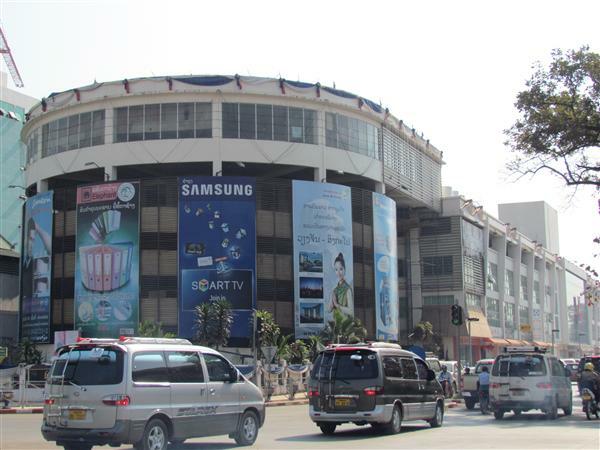 If you want to buy some souvenirs, Talat Sao is one of the option to have a look. 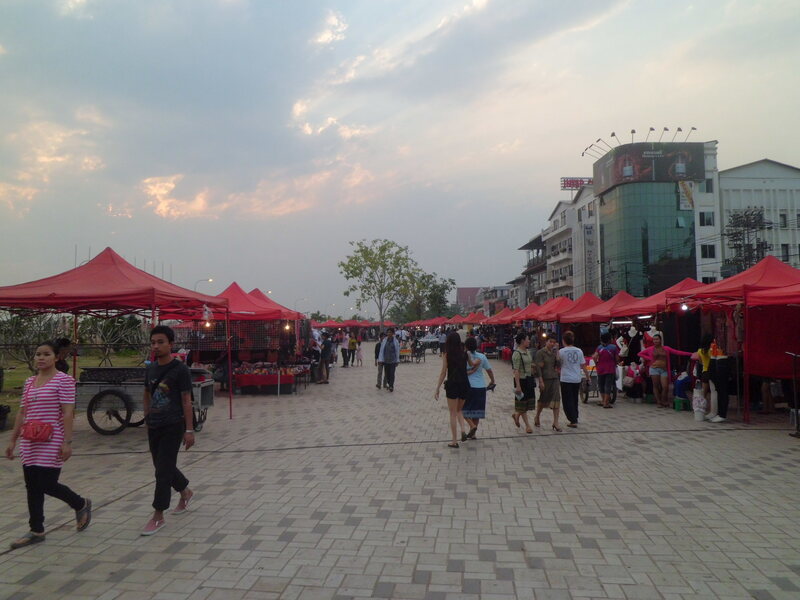 Here, you can choose, you want to shop at the traditional market one or at the mall one. Both of them almost sell the same products like Silks, Buddhist ornaments, T-shirts and other souvenirs. Don’t worry, you can bargain at both of the place. 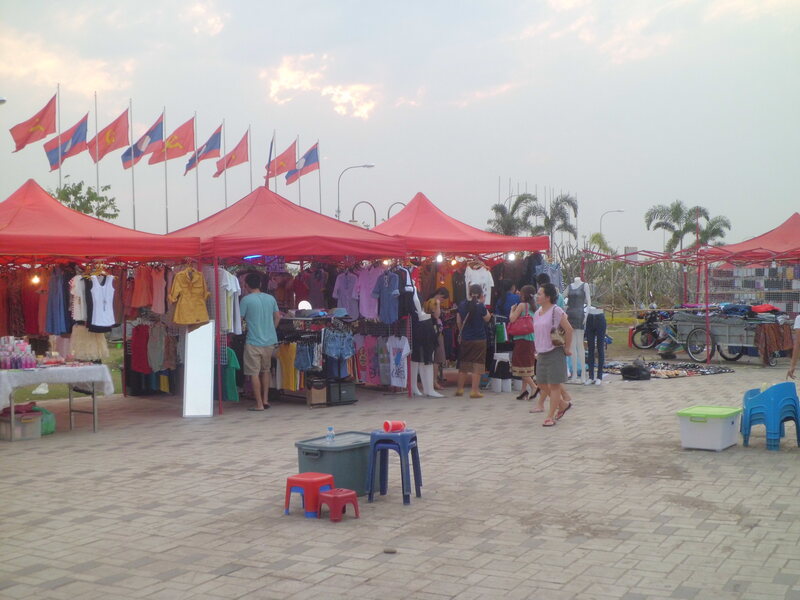 Since the sun starts to set, some stall at night market which is located beside the river bank have already opened. Not only souvenirs like t-shirt, key chains, silks, paintings and small Buddhist ornament you can find here, but you can also taste how delicious Laotian snacks and cuisine are. Before shopping, make sure that you pay a visit to the river bank to see the sunset with the other tourists. Every time I passed this restaurant, I was always tempted to have a visit. Its unique architecture with different thematic for each dining spot (rooftop, inside the building with live music, and open air dining table and bar in its yard). 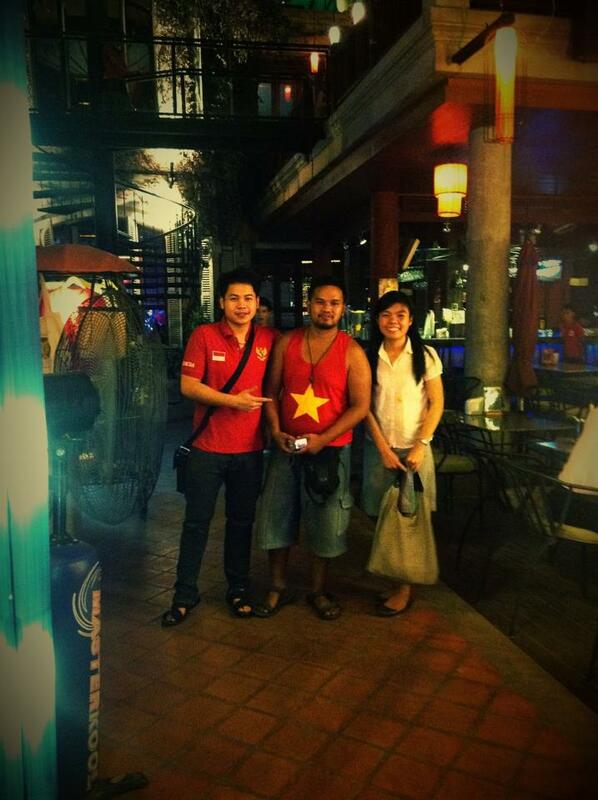 My two Laotian friends, Sam and Sing-sing took me here to have dinner. We sat inside the building and got entertained by live music performance. The place is quite cozy, any where you pick the spot to dine in. At the first time, I and the others plan to have dinner at this place. But when we look at the menu and see the price, err… I think I’ll gonna consider it again. The foods in the restaurant around the Fountain are quite pricey. But it is worth for the atmosphere served, with the fountain as main show, and live music which accompanies our dinner time, I believe it would make the fine dinner we have here become complete. But since I will gonna have my other itinerary (visit Philippines the day after), so I prefer to spend the money for it, lols. But trust me, this place worth a try. Well, for me, visiting Lao in just 2 days is totally not enough. There are a lot of place and region I really want to visit. The exotic Luang Prabang and the amusing Vang Vieng would be my next agenda if I have another opportunity to visit this country again. 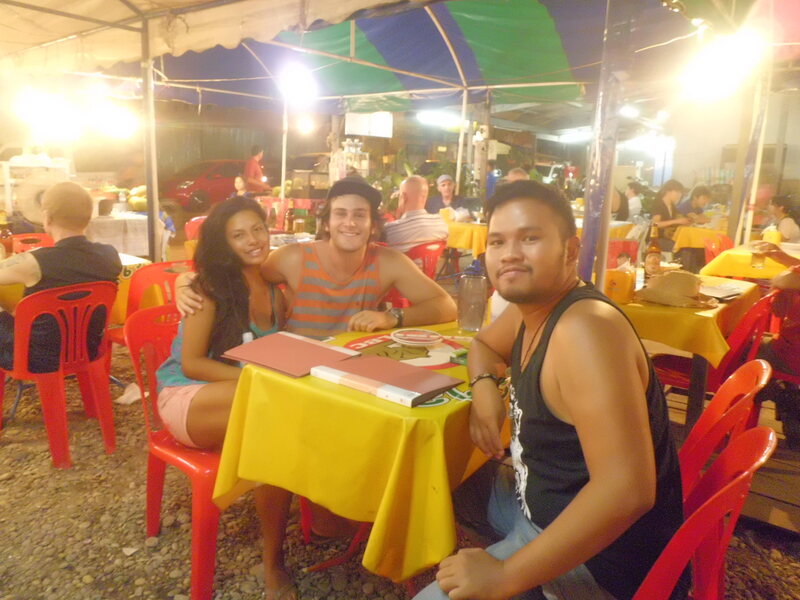 Thanks to Sam and Sing-Sing who allowed me to feel the warmth of Laotian and taste how delicious the local food is. Thanks to John and Cristina who became great and lovable travel partners. Will gonna miss you all and hope that we will have another opportunity to meet up again. Warm hug from Indonesia. 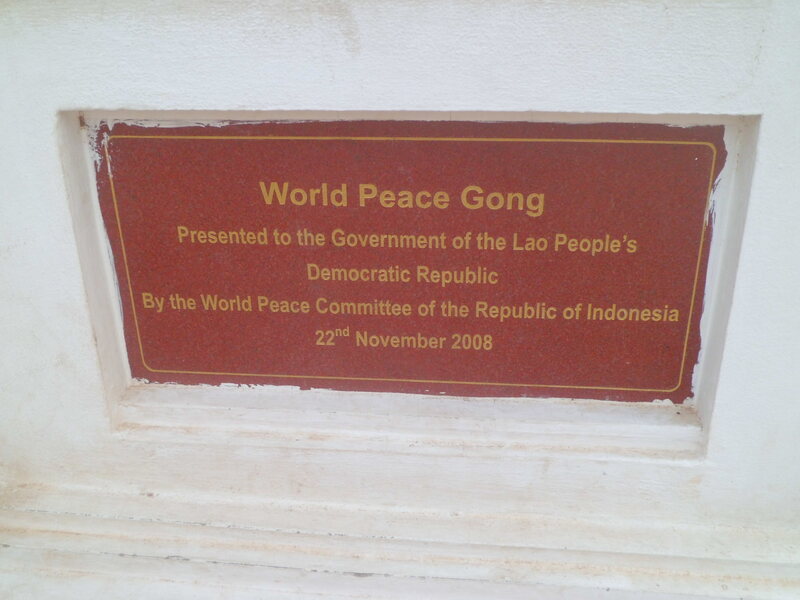 Thank’s ya ndra, jadi kepengen pergi ke Laos nih.. Previous PostUniversal Studio Singapore! Yaaay!